Talk about geeky. Sly Fox Brewing Company, a Pennsylvania brewery with a history of doing amazing things with beer in cans, recently released the first ever beer with a removable can lid. 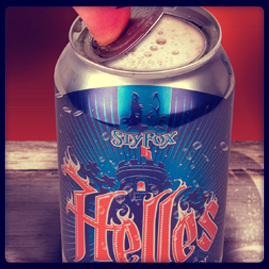 Using technology developed by Crown Holdings, Sly Fox is using the new lid on their Helles Golden Lager. This is a German style lager brewed with imported German Pils malt and Saaz and Hallertauer hops. The can technology allows the removal of the entire lid of the can, turning the can into its own glass. Sly Fox Brewing was one of the first craft brewers to use cans back in 2006. Will have to try it out the next time we’re in Pittsburgh!